Arthritis Caused by Immune System? People with arthritis may in future benefit from new medical findings about the cause of inflammation in stiff and swollen arthritic joints and joint pain. And, new discoveries about the immune are leading to more effective and safe dietary supplements for stopping inflammation and swelling before it starts. US Scientists have discovered an immune cell they say could lead to new treatment for inflammatory diseases and painful swollen joints. The researchers, whose findings were released in the journal Nature and Immunology, show how a new kind of cell causes the body’s immune system run amok. The immune system causes pain and inflammation by producing an excess of the IL-17 that's typically found in arthritic joints. Finally, The Cause of Inflamed Arthritic Joints? "We think this has finally elucidated some mechanisms for autoimmune disease and arthritis," says Dr Chen Dong. Evidence had been building that people who produce too much of a protein called interleukin 17 (IL-17) can suffer runaway inflammation in a range of body tissues. But no one knew what made the IL-17 that caused the trouble. The US team found a new population of T cells, or white blood cells, that churn out interleukin 17. Scientists are excited about finding this new type of “helper cell” which they now call the TH cell, as the culprit for initiating chronic inflammation and autoimmunity in a variety of body tissues. The investigators say they are a lot closer to understanding the swollen inflammatory response that causes arthritic joints. They hope that this discovery will lead them to be able to effectively treat these inflammatory diseases – if not stop them before they start. Fortunately, scientists have also discovered that there are key nutrients that “feed” and regulate the immune and thereby prevent inflammation. A cysteine-rich proteins have been found by medical researchers to be able to "optimize" the immune function, and they are also finding that vitamin D plays an important part in regulating the immune response. Researchers prior to Dr. Chen Dong’s discovery had already implicated the immune for osteoarthritis and Rheumatoid arthritis. They noticed that with Rheumatoid arthritis there are both UNDER active and OVER active cells, so that people with arthritis typically have poor T-cell activity, but overactive B-cell activity. Scientists have also demonstrated that the glutathione content of these T-cells in rheumatoid joints are significantly lower than in the peripheral T-cells of the same patients. How to increase the effectiveness of “low” immune cells while decreasing the activity of “overactive” immune cells? Nutritional interventions are being found for re-establishing the balance of the immune system. A team of rheumatologists from Leiden University Medical Center in the Netherlands found that inflammation in the joints improved at a cellular level. There are now immunotherapy proteins for people with arthritis who can now be pro-active and lessen their symptoms with immune supplements for joint pain. You can best “feed” and “modulate” your immune system by using an immune protein that's been clinically shown to build a high immune system. The best immune system supplements "modulate," or strengthen and balance the immune response so it does not over react. Adding a protein that's been proven for a high immune system, can now help disappear arthritic aches and pains. "I owned a clinic for ten years, doing eight to ten one-hour massages a day. Eventually this took its toll on my hands, forearms and elbows! I was forced to reduce the treatments I could give to two hours a day, and I was taking several all-natural supplements for my knuckles and tendonitis in my elbows. Then I heard Dr. Gutman, a glutathione expert, explain the importance of improving glutathione by using an immunotherapy protein. Within one month of taking this protein, I was able to drop one of my anti-inflammatory supplements. The following month I was able to drop my other supplements. I thought to myself, 'I probably have a lot of oxidative stress on a cellular level from the physical work I have done with my hands, which would cause glutathione depletion. By the third month I was able to get off the third supplement that I had taken for about seven years. I am delighted! I thought I had wrecked my arms for life, but found the healing power of immunotherapy proteins to be everything Dr. Gutman said it was! That third month of being on this high immune system supplement I went water skiing with friends on a beautiful lake that was just like glass. To my surprise, I found that my arms, legs and thighs did not even get sore after skiing for over a half an hour. And the last time I went roller blading with a friend 18 years my junior, he had to ask me to slow down three times! I am thrilled." Vitamin D has recently been found to play a much more important role than we thought, and it is now believed to help regulate the immune system, thereby improving inflammation. One recent study showed that taking 400 IU or more of vitamin D daily was effective in delaying or stopping the progression of osteoarthritis of the knees. It did not, however, seem to prevent the disease from developing. Whether it is the vitamin D or other nutrients in cod liver oil, a daily dose of this oil may be good prevention. For instance, people who have suffered a sporting injury which predisposes them to the early onset of osteoarthritis, should consider taking cod liver oil, according to new research. Scientists from Cardiff University, Wales, UK, found cod liver oil effective in slowing down the destruction of joint cartilage in patients with osteoarthritis. It was the first time a clinical study has proven the connection. Their trial shows that 86% of pre-operative patients with arthritic pain waiting for total knee joint replacement surgery, who took cod liver oil capsules daily, had no or significantly less enzymes that cause cartilage damage, in comparison to only 26% who were given a placebo. Fish oil and omega 3 oils are natural remedies for joint pain by their anti inflammatory effects. Strong evidence shows that many of the changes in arthritic and RA-affected joints are the consequence of oxidation and free radical damage. Oxidation is a normal process that occurs in our bodies. However, it produces harmful by-products called free radicals. Antioxidants help scavenge these damaging substances. It has long been known that oxidation plays a role in joint damage and new findings support that antioxidants may suppress inflammation by getting rid of the free radicals. New studies support what researchers have suspected for some time -- that antioxidants in brightly colored fruits and vegetables offer protection against inflammatory arthritis. Researchers have found that a modest increase in antioxidants from brightly colored fruits and vegetables - just a glass of orange juice a day - lowered the risk of inflammatory conditions such as rheumatoid arthritis. 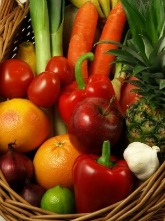 Best to eat your fruits and veggies and add immune supplements for inflammation for less pain! Why find natural remedies for joint pain? Why use a supplement for joint pain to heal the body rather than rely on pain killers? A recent study shows that most prescription and over-the-counter painkillers increase the risk of heart attacks. In the wake of the largest study to date showing most nonsteroidal anti-inflammatory drugs (NSAIDs) -- including ibuprofen, naproxen, and Celebrex -- increase the risk of heart attacks in people with arthritis, experts are once again urging all involved to weigh their individual risks when choosing a painkiller. "This is a class effect of all the drugs," says researcher Gurkirpal Singh, MD, professor of medicine, immunology, and rheumatology at Stanford University Medical School about his study presented at the Annual European Congress of Rheumatology in Vienna, Austria. We hope that you have been inspired to find a supplement for joint pain that works for you. Relying on pain killers for joint pain should be your last resort. Scientists like Dr. Chen Dong are hopeful that these new findings will enable them to find medication that can stop chronic inflammatory disease from developing in the first place! Even after Vioxx, there are still serious warnings for all of today’s common pain relief medications including Celebrex, ibuprofen, and naproxen. Best to -- it is wise to increase your options with immune supplements for joint pain and natural remedies fro arthritis inflammation.